Vyvyane Loh is an author of Malaysian-Chinese descent that currently lives in the US. Loh spent her undergraduate years at Boston University which she graduated with a double major in Biology and Classics. She proceeded her education at the Boston University School of Medicine, where she undertook a residency in internal medicine. Loh’s devotion for creative writing resulted in her acceptance of the full scholarship to the Masters of Fine Arts program in Creative Writing at Warren Wilson College. She combined professions of an aerobics and dance instructor, personal trainer and part-timed physician while pursuing her degree. She is currently the medical director of the Earth and Sage Medical Spa in Newton, MA. 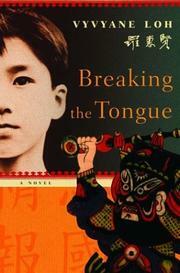 Vyvyane Loh's "Breaking the Tongue"
Loh’s novel Breaking the Tongue has been written during her MFA program and was published in 2004, three years after her graduation. The plot of the novel is set in Singapore occupied by the Japanese during World War II. It discusses several key issues pertaining to race, national identity, class and language of the Chinese diaspora which remain relevant in the postcolonial multi-racial societies of Singapore and Malaysia until today. The author projects on the important social transaction along with the major national identity crisis of the Singaporeans disillusioned in the defeat of their colonial masters.